don't look at me like that. 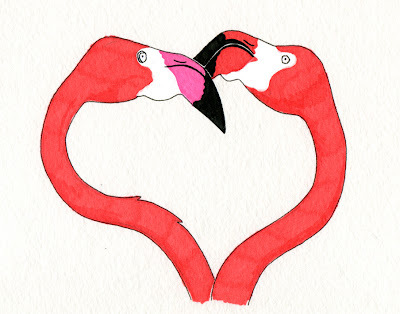 yes, once again, i have drawn something i've already drawn but BUT it's a different type of flamingo. and you can never have too many flamingos. here's something you should care about! yeah pretty good. i definitely want to practice using prismacolours more, because i can see their potential for shading, which my lovely matte poscas do not have. but they do bleed on paper like a mofo, hence my unwanted black outline. anyway, these guys are the only north american flamingos. there are millions in south america, and i've probably seen half of them. man do they love funny coloured and chemical-ed lakes.